Ratha Saptami or Rathasapthami (Sanskrit: रथसप्तमी or Magha Saptami) is a Hindu festival that falls on the seventh day (Saptami) in the bright half (Shukla Paksha) of the Hindu month Maagha. It is symbolically represented in the form of the Sun God Surya turning his Ratha (Chariot) drawn by seven horses (representing seven colours) towards the northern hemisphere, in a north-easterly direction. It also marks the birth of Surya and hence celebrated as Surya Jayanti (the Sun-god’s birthday). Sun worship is deep rooted in the Vedas of the Hindu religion and its antiquity also relates to several mythologies of the world such as that of China, Egypt and Mesopotamia. The Gayatri Mantra jap – the sacred Vedic chants to Savitr (Sun god) – is recited by the Hindus every day with great reverence. As the puranic Hinduism evolved, the worship of Sun was established. In the Rig Veda Mandala 10/Hymn 85, the sun god's bride seated on a chariot pulled by two steeds is mentioned. This symbolism is therefore common to both Norse mythology and Vedic history. 10. Her spirit was the bridal car; the covering thereof was heaven: Bright were both Steeds that drew it when Surya approached her husband's, home. 12. Clean, as thou wentest, were thy wheels wind, was the axle fastened there. Surya, proceeding to his Lord, mounted a spirit-fashionied car. Ratha Saptami is symbolically represented in the form of the Sun God Surya turning his Ratha (Chariot) drawn by seven horses, with Aruṇa as the charioteer, towards the northern hemisphere, in a north-easterly direction. The symbolic significance of the ratha and the seven horses reigned to it is that it represents the seven colours of the rainbow. The seven horses are also said to represent the seven days of a week starting with Sunday, the day of Sun god Surya. The chariot has 12 wheels, which represents the 12 signs (each of 30 degrees) of the Zodiac (360 degrees) and constituting a full year, named Samvatsara. The Sun’s own house is Leo (Simha) and he moves from one house to the next every month and the total cycle takes 365 days to complete. The Ratha Saptami festival seeks the benevolent cosmic spread of energy and light from the Sun God. There are Surya temples all across India where Ratha Sapthami is fervently celebrated. However, the most famous one is the World Heritage Site of the Konarak Sun Temple, in Konark, Orissa. Besides Konark, there is another sun temple in Orissa, the Biranchi Narayan Temple (Biranchi khetra) in Buguda, Ganjam District. There are sun temples in Modhera, Gujarat, created by king Bhimdev of the Chaulukya dynasty, in Arasavalli, Andhra Pradesh and in clusters of Navagraha temples in Tamil Nadu and Assam. The Sun Temple at Martand (Jammu and Kashmir) and Sun Temple of Multan are temples, which were destroyed during Muslim conflicts in the past. Arka (in Sanskrit, meaning a ray or flash of lightning) leaves,also called Aak in Hindi, Ekka (in Kannada), Jilledu in Telugu, Erukku in Tamil and Calotropis Gigantea (bowstring hemp) in English. Arka is also a synonym for Surya or Sun. Its significance to Sun God could be compared to the significance of Tulsi (Ocimum tenuiflorum) leaves to Vishnu. Arka leaves are also used for worship of god Ganesha known by the name Arka Ganesha and also for Hanuman worship. Its stems, called samidha (sacrificial offerings of wood) are used for the Yagna ritual as a sacrificial offering to a ritual fire. Its shape is said to represent the shoulders and chariot of Sun God. Its use during the ritualistic ceremonious bath involves placement of seven leaves - one on the head, two on the shoulders, two on the knees and two on the feet. On this day, in South India, Rangoli is drawn with coloured rice powder depicting a chariot and seven horses as symbolic of the Ratha Saptami. Cowdung cake is also burnt at the centre of this depiction and milk boiled on the fire is offered to the Sun God. In some of the important Vaishnavite temples such as the Tirumala, Srirangam, Srirangapattana and Melukote, Ratha Saptami is one of the important festivals of the year. Annual Car Festival of Lord Veera Venkatesha of Sri Venkatramana Temple in Mangalore is held on this day and is famously known as Kodial Teru or Mangaluru Rathotsava. ^ "January 2018 Marathi Panchang Calendar". Retrieved 2017-10-05. ^ "2015 Hindu Festivals Calendar". ^ "2017 Marathi Panchang Calendar". Retrieved 2016-10-22. ^ "Ratha Saptami 2013 Date". hindusphere.com. Retrieved 30 January 2013. Ratha Saptami falls on the Magha Sukla Paksha Saptami i.e on the seventh day of the waxing phase of the moon in the month of Magha. ^ "Tirumala TTD Ratha Saptami Ardha Brahmotsavam 2019 Schedule". TTO. TTO. Retrieved 7 February 2019. ^ a b c d e "Rathasaptahmi". Scribd. Retrieved 2009-11-26. ^ a b "Hindu Fasts and Festivals". Ratha Saptami. Retrieved 2009-11-26. ^ a b Narayan, K.K.V (2007). 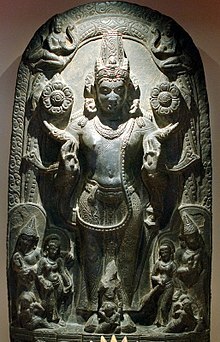 Flipside of Hindu Symbolism: Sociological and Scientific Linkages in Hinduism. Sun Worship. Fultus Corporation. p. 26. ISBN 1-59682-117-5. Retrieved 2009-11-26. ^ a b "Mysore, Melkote witness Ratha Sapthami processions". Mysore Samachar. Retrieved 2009-11-26. ^ K, Kandaswamy. "Ratha Saptami in Tirumala Tirupati". Live Trend. K Kandaswamy. Retrieved 23 November 2017.